The responses of leaves and unicellular algae to supra-optimal levels of light are well-studied but little is known about the responses of colonial algae to such stresses. To investigate differences between single cellular and colonial species, Van den Berg et al. (10.1104/pp.18.01499) have studied the regulation of photosynthesis and photoprotection during photoacclimation for the colonial green alga Botryococcus braunii. 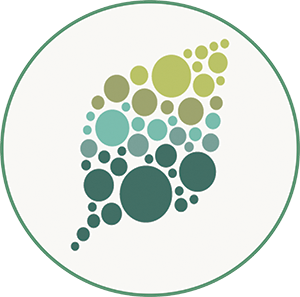 This project is of more than academic interest since Botryococcus braunii is an interesting candidate for biofuel production because it produces high-quality long-chain hydrocarbons. The oil content of B. braunii colonies can also be very high (30%–40% of its dry weight) and this feature makes the colonies float close to the water surface, where they are subjected to high light (HL) intensities. The genome of B. braunii has also been sequenced recently. Unfortunately, the growth rates of B. braunii colonies are prohibitively low for commercial utilization, despite numerous studies aimed at optimizing growing conditions. As expected, the growth rate of B. braunii depends on light conditions: as light intensities rise, the growth rate increases up to a saturation level and then a drop occurs due to a decrease in photosynthetic efficiency. In the present work, the authors show that B. braunii shares some high-light (HL) photoacclimation strategies with Chlamydomonas reinhardtii and other unicellular green algae, including decreased chlorophyll content, increased free carotenoid content, and increased nonphotochemical quenching. 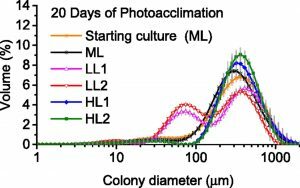 In addition, B. braunii has unique HL photoacclimation strategies related to its colonial form, including strong internal shading by an increase of the colony size and the accumulation of extracellular echinenone (a ketocarotenoid): these responses have the effect of reducing the light intensity experienced by the majority of the cells, leading to lateral differentiation in Chl content and antenna size in the colony.